The Web is a repository for a vast amount of data. It also is the channel through which these stored data can be retrieved, exchanged or uploaded. Just like physical items are easy to find and retrieve, so is the case with data. Data needs to be organized properly for storage and ease of retrieval. This organization is done in databases. Store and manage data efficiently. Transform data into useful information. Link different data to provide a new perspective. Improve productivity and increase scalability. Relational Databases: These are the most popular kind of databases, where data is stored in pre-defined rows and columns. One row stores one instance of the data, while a column gives the values associated with that instance. The data is managed using a Structured Query Language or SQL. NoSQL Databases: These databases store data in other forms than tables. They are very useful in working with large volumes of data. They are especially useful to manage unstructured data or data distributed at various locations. 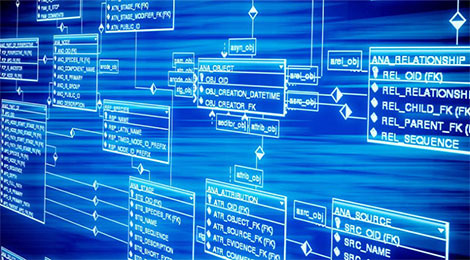 Column databases, graph databases, key-value databases are the popular types of NoSQL databases. Object-Oriented Databases: These databases store data as objects rather than tables. Instead, the data and their relationships are managed by 'pointers'. An Object Query Language or OQL is used to manage the database. To make the best use of the database technologies, it is imperative that you invest in developing a database that will serve your individual needs. Nonstop Corporation can help you in doing this. Assistance in choosing the right type of database for your needs. Designing the architecture of the database. Incorporating features such as multiple users, web access, security, storage of different formats of data, email triggers for certain operations, powerful reporting capability and offsite backing up of the database. Administration and management of the database. Performance audit and tuning of databases. Support for backup and recovery. Help in upgrading or migrating a database.